It's smaller than a Zippo lighter and weighs less than half an ounce, but the gray Tini Metallic Key Chain Light from Nitecore has as much power and sophisticated circuitry as many full-sized flashlights. 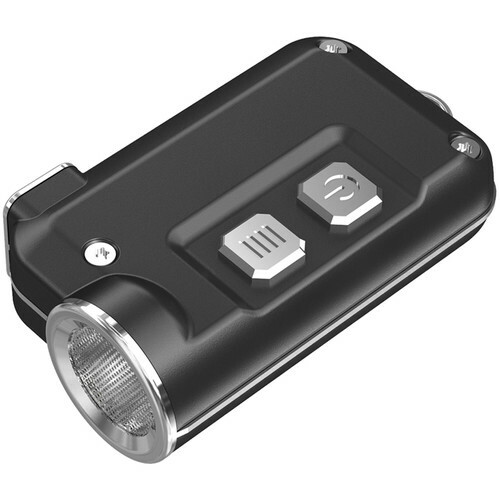 This little powerhouse produces up to 380 lumens of bright light, features a straight-to-Turbo option, recharges via USB, and utilizes a bead surface lens to create a soft and uniform beam. The Tini offers big-light technologies such as Advanced Temperature Regulation to prevent overheating, precision digital optics technology for a long beam throw, and constant current circuitry for consistent performance. It has built-in overcharge, over-discharge, and short-circuit protection and stops drawing power automatically when it is fully recharged. Runtimes range up to 60 hours. There's an indicator light that lets you know how much battery power you have left. The build is remarkable for such a small light, featuring an gray housing with electroplated metal edges and switch buttons, customized Torx screws, and a stainless steel loop for attaching your key ring. Tini Metallic Key Chain Light (Gray) is rated 1.0 out of 5 by 1. Rated 1 out of 5 by Gary from Wouldnt charge. This light was defective right out of the box. When plugged in to a USB power source the two buttons have LEDs that are supposed to indicate its charging but when I plugged it in I got nothing. I have returned it to B&H for a refund.